Our newsletter, Views from the Rockies, is produced and circulated by the Rocky Mountain Synodical Women's Organization (RMSWO). It provides information concerning current programs, projects, and other information. Here women share their ideas, their thoughts, their concerns, and their joys. 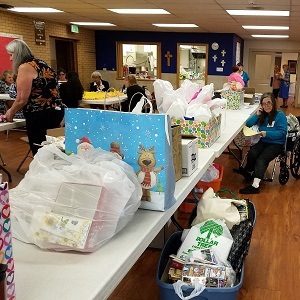 The Views from the Rockies seeks to provide the news that all women in the Rocky Mountain Synod need, not just for leaders but also for laywomen. Check out the December 2018 issue of Views from the Rockies! 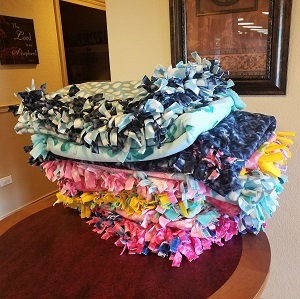 From the November issue, here are two photos from our 2017 Fall Gathering In-Kind... ten tie-blankets for Sarah's Home and hygiene kits for the homeless. If you aren't already receiving Views from the Rockies, then sign up today! Subscriptions are only $8 for a year of quarterly issues. A subscription form is here. One copy is distributed free to every church in the RM Synod, cluster coordinator, current RMSWO board members, past RMSWO presidents, the Rocky Mountain Synod office, and Women of the ELCA churchwide staff. Copies are also sent to individuals and groups who have subscribed. Many congregations have subscriptions for each of their circles, unit officers or their women’s board, and new members of their congregations. The Views is published quarterly: (Jan/Feb/Mar; April/May/June; July/Aug/Sept; Oct /Nov/Dec). Expiration dates are printed after each person’s name and are in red if the subscription is about to expire. Please make a note of that date and renew before the next issue. ALSO, if your address has changed, or will change soon, please notify the RMSWO treasurer of the new address ASAP. Letters, articles, and photographs of interest to the RMSWO may be submitted to the editor to be included in the newsletter must be submitted by the 15th of each quarter to make the following quarter's newsletter. Hardcopies may be difficult to include in the newsletter but will be accepted and may not be returned. E-mail your articles to rmswoelca16@gmail.com. Articles should be typed or legibly hand printed on one side of paper and should contain the author’s name, address, telephone number, and name and city of home congregation. When emailing, please send your file as either the text in the body of the email message, or as an attachment of either a Microsoft Word® document (ends in .doc), a plain text document (ends in .txt) or in portable document format (ending in .pdf). Please do not do extensive formatting of your document beyond bold and italic fonts and indicating paragraph breaks, as your document will be formatted to fit with the newsletter. If sending graphics to be included in the newsletter, please send either original photographs or electronic image files. If sending electronic images, please send images that are either JPEG or TIFF files (please no BMP or GIF files, or images you found on the web). If you can control the resolution, please set it at 300 dpi; if not, please send the file with the largest resolution that you have. You may email your images to the same address given above, or mail a disk to the addressed above (again, please include a self-addressed, stamped envelope large enough to return disk in if you wish to have your disk returned). Please do not submit images that are placed inside a text document.